For redistricting basics, visit the city's web site redistricting page here. Sharp hopes the City Manager's office will forward more than one potential redistricting map to the council for consideration. The current map favored by the KC Redistricting Advisory Committee splits the 6th District, putting much of it into the 5th and extending boundaries on the west into the Waldo area. Sharp, along with the South KC Chamber of Commerce, the Southern Communities Coalition, the KC Neighborhood Advisory Council, the 3-Trails and Martin City CIDs, and virtually every HOA in South Kansas City, has endorsed a "Community Map," which the city calls "Map No. 7," that preserves more of the 6th District boundaries. So far, the city has not placed the Community Map on its web site. The Kansas City Redistricting Advisory Committee will forward one redistricting map to the City Council for consideration. Three were submitted, but the committee, after five public hearings and in the face of opposition from a united 6th District, endorsed the first map it considered, which was drawn up by committee members from the city's northland. Several committee members said they were concerned that two other maps, which kept 6th District boundaries more or less intact with some variation, "could" violate the Federal Voting Rights act which is designed to protect minority voting blocks because it did not leave a substantial number of minority voters in the 5th and 3rd districts. They also complained that the other two maps left too much population in the 6th District, which did not give it enough of a ceiling for future growth. They said it was important to keep all district populations as close to equal as possible. The map the committee recommended beefed up populations in the traditionally minority 3rd and 5th districts, while combining the city's historic Northeast and West Side neighborhoods, increasing the likelihood of a Hispanic council member. A "Community Map" drawn up by residents of the 6th District and shown to the committee at an Oct. 10 public hearing was not formally considered. 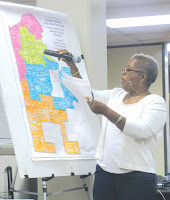 Committee member Eslun Tucker moved to have the map considered for forwarding to the City Council as one of three potential redistricting options, but no committee members would second her motion. The Community Map had the written support of virtually every HOA in South Kansas City, as well as the Martin City and 3-Trails community improvement districts, the South Kansas City Chamber of Commerce, the KC Neighborhood Advisory Council, and the Southern Communities Coalition (see the Advocate's coverage of the Oct. 10 public hearing, at which all of those groups spoke, right here). An earlier compromise map drawn up by Tucker was not considered, either. The one map the council will now consider splits the 6th District, putting most of its economic redevelopment areas into the 5th District. That includes Bannister Mall, the KCPD South Patrol, and other vital areas championed by 6th District residents for years. Councilman John Sharp pulled no punches in expressing his disappointment. "I think the real reason they only forwarded one map is that this was a back room deal that was hatched long ago," Sharp said. "The whole public hearing process, where hundreds and hundreds of people opposed this map, was nothing but a farce. Our people showed up to participate in the democratic process, but they might as well have been talking to a brick wall." There is some hope, Sharp said, because the City Council does have the authority to redraw the lines any way it wants to, without the input of the advisory committee. But Sharp doesn't think that's likely. "Clearly there will be an effort to push this through before anyone can mount any real opposition," he said. "I am certain there will be a resolution to approve this as soon as next week." Sharp referred to the council's Oct. 27 meeting. "I had hoped we'd have some more public input," Sharp said, "but after this, how can anyone expect that they can speak at a public hearing and have it mean anything?" The Grand Summit apartment complex may be expanding. The Grandview Board of Aldermen had a public hearing at its Oct. 11 regular session to consider a plan for an additional phase of the multi-family development near Shalimar Park and the Belvidere neighborhood on the south side of the city, just south of 150 Highway. The developer, Lindsey Management, wants to add two additional phases of construction to the project, each including 288 units. That would bring the total number of living units in the complex to 900. The original project was approved in 2002. There are some 325 units at the complex. In addition, Lindsey Management would be responsible for upgrades to Corrington Ave., which would connect the extension of Grand Summit Blvd. within the complex to 155th St. on the south. Corrington Ave. would be built to city standards and become a public street. Overall the aldermen were supportive of the project, though Alderman Jim Crain echoed some concerns the Planning Commission had about the look of the development. The Planning Commission recommended approval of the project on Oct. 5, but required the developer to use exterior building materials that would match the character and quality of the existing development, with some color variation to avoid monotony. One citizen testified at the Planning Commission hearing, expressing concern that the complex would be too close to the Belvidere neighborhoods, and city staff received one phone call about it as well (possibly from the same person). But at the aldermen's public hearing, no members of the public spoke either for or against the project. "I think it's a very positive thing for the city of Grandview," said Alderman Brent Steeno. "That many more apartments means that much more people living and shopping here, that much more sales tax...I think it's going to be great." City staff made several changes to the developer's proposal, requiring two parking spaces per unit, requiring Corrington Ave. to be up to public standards, and requiring the developer to submit a storm water runoff management plan. More than 100 South Kansas City residents of all ages, races, and walks of life crowded the Baptiste Educational Center Oct. 10. They were there to fight to keep the 6th District from being split up as part of a plan to redraw the boundaries of the city’s council districts. It was the fourth of five public hearings held by the KC Redistricting Advisory Committee, which will present no more than three options for redrawing district lines to the City Council on Oct. 20. Redistricting is necessary to balance populations in the four districts in light of the 2010 census, which shows populations growing north of the Missouri River and in South Kansas City, but declining in the central city. The committee has considered two maps so far. The first, drawn up by committee members Keith Nelson and John Fairfield, who represent communities north of the river, splits the Hickman Mills School District in half and removes such 6th District landmarks as the Trailside Center and Bannister Mall, placing them in the 5th District. A second map, drawn up by committee member Eslon Tucker, who represents the 6th District, kept more of the 6th District intact but didn’t go far enough to satisfy many South Kansas City residents who don’t want to see their communities fractured. A third map, drawn up by a committee of local volunteers led by Hickman Mills School Board President Bonnaye Mims, was introduced at the meeting, and it was this map that some 65 people spoke in support of, urging the redistricting committee to present it to the City Council for consideration. The KC Neighborhood Advisory Council, the Southern Communities Coalition, the Center Planning Council, two community improvement districts, the Community Assistance Council, and virtually every homeowners association in South Kansas City have passed resolutions in favor of the new map and against the first map. The second map was essentially ignored. The new “Community Map,” as residents called it, puts the northern boundary of the 6th District at Gregory Blvd. on the northwest, then south on Holmes roughly to Bannister Rd., then north on 71 Highway to 87th Street, east to James A. Reed Rd., then south to I-470, which is the proposed northeastern boundary. Both other maps placed much larger chunks of the 6th District into the 5th or 4th council districts. Dennis O’Neil said the 6th District was the perfect example of a racially diverse district that has come together. Dan Osman, who serves on the Hickman Mills School Board, urged the committee not to consider maps that place affluent parts of Waldo and neighborhoods off Ward Parkway – currently in the 4th District – into the 6th. Doug Smith, president of the Community Assistance Council, said he was worried that the first proposed map would take the CAC out of the 6th District. He said his daughter and son-in-law live in the affluent part of the 4th District that the first map would bring into the 6th, and that they don’t care what happens in South Kansas City. Tim Henry, president of the Birchwood Hills homeowners association, said he was worried that the first map would give too much influence to affluent communities in the western part of the district. State Representative Jason Holsman, who represents a portion of the 6th District, personally endorsed the Community Map, and warned the committee that other scenarios would drive a wedge between east and west in South Kansas City. Tim Cushing, president of the Ruskin Heights homeowners association, said he thought the first map could be the straw that breaks South Kansas City’s back. Steve Rinne, of the Kansas City Port Authority, said he believed the Community Map would ensure that money from the Public Improvements Advisory Committee and other funding would not be diminished. “I’m opposed to the first map because of the harm it would do to the entire city’s economic well-being,” he said. Lou Austin, chairman of the 3-Trails Community Improvement District – which aims to promote and revitalize the Bannister Mall area – said he understood that the committee had to balance keeping minority voting blocks intact, making “political deals,” and requirements for population balance. But it also has a fiduciary responsibility to ensure that South Kansas City isn’t hurt economically. “What good is a political victory if the result is an economic wasteland and fracturing of good communities?” Austin asked. Barb Engel, president of the Martin City Community Improvement District, said her part of town wouldn’t be affected geographically by any of the maps. But she was concerned that capital improvements projects vital to Martin City – including the renovation of 135th Street – might not get funding if the district is split up. Carol McClure, of the Southern Communities Coalition, urged the committee to consider the community map. “The 6th District is the ideal district. It’s the most diversified in the city,” she said, adding that the Coalition formally endorses the Community Map. “Map 1 takes the heart out of the 6th District,” said Carol Winterowd, president of Center Planning and Development. Jane Brown, committee chair and local lawyer, said she was taken aback by the turnout. Committee member Nelson, co-author of the first map that so many spoke against, said he was impressed by the community spirit of the 6th District. “I am very impressed with the compassion you have shown for your district,” he said. However, Nelson, Fairfield and committee member and political consultant Steve Glorioso voiced skepticism that the population numbers on the Community Map were accurate. Glorioso said that the map was coming to the committee late in the game. Brown reminded the audience there is one more public hearing at 7 p.m. Oct. 18 at the Mohart Center. The committee will make its final decision about which maps to forward to the City Council at 3:30 p.m. at City Hall. A brand-new Farmer’s Market is headed for 8th and Main streets in Grandview. Residents will get a chance to learn more about the new site at a public meeting at 6 p.m. Oct. 18 at City Hall. The project should be complete by the end of next year. The Grandview Board of Aldermen gave its go-ahead to the proposed design at its Oct. 4 work session. 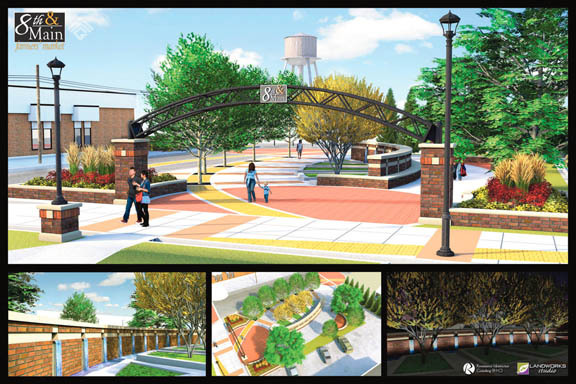 “The intent of this improvement project is to develop a public place that people can use to meet and gather when visiting businesses in the downtown area,” said Dennis Randolph, public works director. The project is an expansion of work started this year with phase one of Main St. improvements between KC Southern Railroad and 10th St. The total estimated cost of the project is about $321,439 – but Uncle Sam is picking up the bulk of that. “We have $225,000 in Federal aid, and the city’s cost will be $96,429,” Randolph said. The improvements to the site will include landscaping, a sidewalk, lights, a truss-covered entranceway, and a new “curtain-wall” water feature. The site will provide space for farmer’s market vendors on market days (currently Saturdays) and what Randolph called a “pocket park” at other times. Tony Finlay, director of parks and recreation, said the city is looking for someone to be responsible for recruiting vendors and managing Grandview’s farmer’s market next year. Interested parties should contact Finlay at 316-4880. For questions or suggestions about the market site in general, the public can attend the Oct. 18 public meeting, send an email to suggestions@ci.grandview.mo.us or call the Public Works Department at 316-4856. Kansas City Deputy Police Chief Darryl Forte, 49, a lifelong Kansas City resident and a 26-year department veteran, was sworn in Thursday as the new Chief of Police. 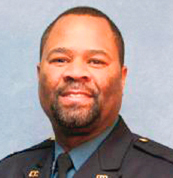 The Board of Police Commissioners voted unanimously to approve Forte for the position, making him the first black police chief Kansas City has ever had. Forte won the position over two fellow in-house candidates, KCPD Deputy Chief Kevin Masters and retired KCPD Deputy Chief Vincent Ortega, as well as Fayetteville, N.C. Chief of Police Thomas Bergamine and Rochester, N.Y. Executive Deputy Chief George E. Markert. Kansas City Mayor Sly James said he was confident that Forte could help improve communication between City Hall and the police department. He said Forte was the best choice because he has long experience dealing with violent crime issues in Kansas City. Jackson County Prosecutor Jean Peters Baker said Forte was the right choice. Forte has most recently been in charge of the department’s financial and capital improvements units. He joined the force at age 23. By 2003, he was a major in the violent crimes division. He achieved notoriety for his work in catching Terry Blair, a serial killer who murdered six women. During interviews for the position Forte outlined specific plans such as flooding homicide scenes with resources to quickly get statements from witnesses, requiring homicide detectives to stay with the department for at least five years, and to start a unit to support witnesses and provide assistance to victims. Forte also shared a strategic plan to build trust between the department and the community, including a monthly public meeting to give residents direct access to him. At several public hearings leading up to the decision, residents and community leaders from across the Metro urged the commission to find a local candidate who had experience dealing with violence. “I’m really pleased to hear Chief Forte will be targeting hot spots and directing resources to help fight violent crime,” Taylor said. 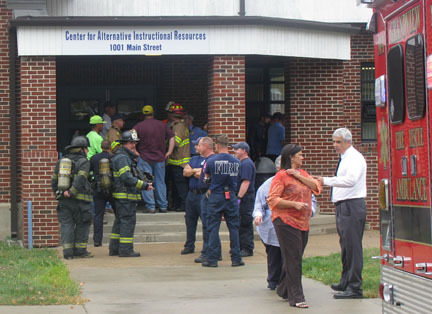 UPDATE: Grandview firefighters were called this morning to investigate an unknown odor at the Center for Alternative Instructional Resources (C.A.I.R.) school building located at 1001 Main and soon discovered that several people were complaining of being sick. 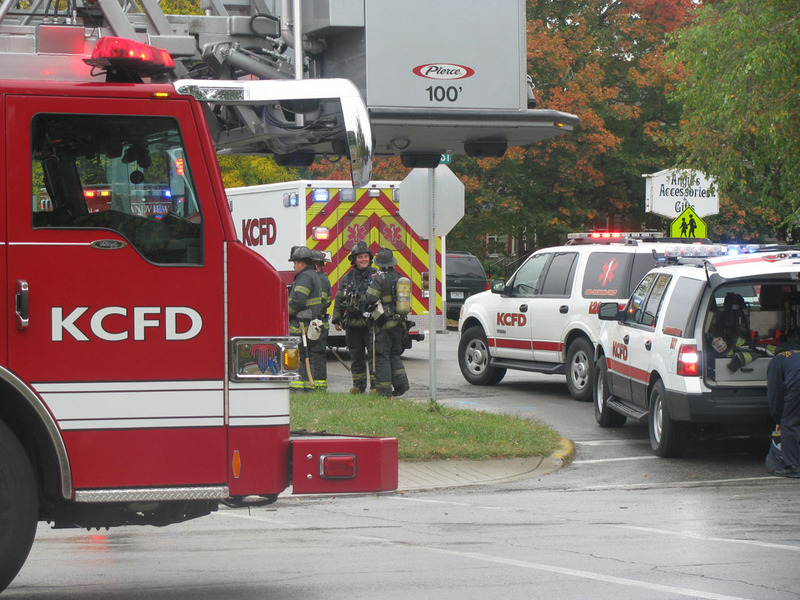 A special fire department meter did not indicate the presence of any dangerous chemicals, but the building was evacuated and a hazmat team from the Kansas City Fire Department was requested in addition to representatives from the gas company. Three out of fifteen people evaluated by paramedics (one adult and two teenagers) were transported to local hospitals for observation by ambulances including units from Belton and Kansas City. The sophisticated testing equipment used by both the hazmat team and gas company also failed to sense the presence of anything dangerous. As an added precaution, the team took an air sample back to their chemist in Kansas City for analysis that resulted in a finding of 12 parts per billion for a combination of floor wax, cleaning solvents and copy machine toner. According to a member of this same team of firefighters, such a reading is typical for most office buildings throughout the United States. With no dangerous conditions found, the building was deemed safe and capable of reopening for school tomorrow morning. Three people were taken to the hospital and a building was evacuated after a suspicious odor hit a Grandview C-4 school district building today, but fire officials are still investigating the cause. Fire trucks, ambulances, and police cars from Grandview and Kansas City were dispatched to the Center for Alternative Instructional Resources (CAIR) after staff reported a suspicious odor inside the building at approximately 12:15 p.m. Students and staff were immediately evacuated outside the building, and eventually moved to Conn-West Elementary while fire department personnel inspected the building. Eleven people were tested for their symptoms, and three were ultimately taken to the hospital as a precautionary measure. One staff member and two kids were taken away by emergency vehicles. Fire officials did not find any known dangerous gasses in the air inside the building, but are still conducting air quality tests. "The Fire Marshall took an air quality test and they're taking it to the lab right now," said Lane Lucas, a district spokesman, at about 2:15 p.m. "We should know the results in an hour or two. That's the final thing we're waiting to make sure we can have school tomorrow, which we anticipate we can." 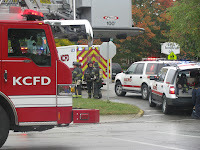 The Kansas City Fire Department assisted at the scene with HAZ-MAT specialists. According to C-4 superintendant Dr. Ralph Teran, the KCFD was using more advanced equipment to inspect the leak to get down to the bottom of the problem. "It's kind of puzzling right now," Lucas said. "There was an odor but officials found no gas." Friends of the Zoo, including Royals legend Frank White, kicked off a campaign to pass 1/8-cent sales taxes in Jackson and Clay counties to fund major upgrades at the Kansas City Zoo. If the measure is approved by voters in November, the zoo will add a major penguin exhibit, along with creative new habitats for the giraffes, the big cats and many other popular zoo animals. Residents of each county that approves the sales tax will enjoy annual free days and other special benefits at the zoo. 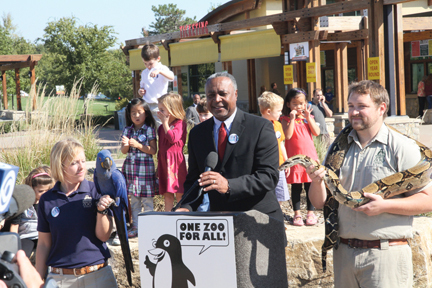 Community leaders and zoo supporters gathered at the zoo in Swope Park last week to tout a Nov. 8 ballot measure in Jackson County and Clay County that calls for a new 1/8-cent sales tax for zoo improvements and operations. Funds would be used to help expedite projects in the zoo’s master plan. A Penguin Exhibit would be completed in the next two years, followed by an Orangutan Canopy section, Predator Canyon for tigers and other big cats, an interactive Giraffe Tree Tops viewing area, an Elephant Oasis, a specialized Gorilla Forest, a modern Sea Lion Cove and a custom-designed Kids Wet Play Zone. The zoo would also expand its educational programs, using Zoomobiles to bring experiences to schools, libraries, and community centers in Jackson County and Clay County. If passed, Jackson and Clay County residents would be eligible for half-price admission to the zoo at any time and would get in free on four designated days each year. They would also get discounts on Friends of the Zoo memberships. The zoo would also sponsor field trips, including transportation, for schoolchildren in designated grade levels, with instruction that meets Missouri Show-Me Standards. The sales tax would raise an estimated $14 million annually, starting January 1, 2012. The tax amounts to one penny on every $8 in taxable purchases in Jackson County and Clay County. An estimated one-third of sales taxes would be paid by shoppers and tourists who do not live in either county. An independent commission made up of members from Jackson and Clay counties would oversee budgeting and expenditures for the improvements. “We can create a truly extraordinary, national caliber zoo that the area will be proud of for generations,” said Chuck Caisley, chairman of the One Zoo for All campaign committee. The Kansas City Zoo in Swope Park is 102 years old. Attendance at the zoo has risen to more than 600,000 visitors per year since the independent private non-profit Friends of the Zoo took over operations in 2002, but zoo experts estimate attendance could grow to 1.12 million by 2022 when the 10-year zoo improvement plan is complete. The expanded zoo would create up to 100 new full-time jobs, along with scores of seasonal jobs for teenagers and retirees. Many jobs would also develop through the construction projects over the 10-year period. The City of Grandview, Grandview C-4 School District, and Hickman Mills C-1 School District all recently set their tax levy rates and examined their revenues for the fiscal year. While Grandview’s city and school boards decided to keep their tax levy rates steady, Hickman Mills decided to raise its rate. Grandview’s property tax levy for 2011 will remain the same. The Board of Aldermen on Sept. 27 unanimously passed an ordinance that establishes a levy of $1 per $100 of assessed valuation for general purposes, 38 cents per $100 of assessed valuation for debt service, and 12 cents per $100 of assessed valuation for park maintenance. Those taxes will be collected as revenue for 2012. Alderman Jim Crain said he was proud that Grandview has not effectively raised taxes in decades. According to Jackson County records, the final 2011 aggregate assessed valuation for the city is $258,787,123. That’s a 2.54 percent decrease from 2010, which was $265,539,937. Shirley Moses, director of finance, told the board at a September public hearing that the decrease was due to declining property values across the Metro area. The tax rate is the maximum allowed by Missouri law. The Hickman Mills C-1 school district raised its debt service levy, hoping to maintain revenues while facing a downgraded bond rating from A+ to A with a negative outlook, as well as a low level of reserves. Meanwhile, bond refinancing and an energy conservation program have been approved to help the district save money. The C-1 levy was raised by a nickel per $100 of assessed value bringing the total levy to $6.3217. The debt service increase from 80 cents to 85 cents means that taxpayers with a $100,000 home whose value has not changed will pay approximately $9.50 more to support their schools this year. Administrators told the board they are projecting a $3.73 million operating budget deficit for 2011-12. The big question looming next year, administrators say, is what will make up federal money that will go away in 2012-13 if there is no additional federal stimulus money. “We will amend [the budget] throughout the year as things change,” Nutterfield said. Last year, the district saw job cuts and building consolidation due to deficit predictions, only to see the district finish the year with a $2 million operating surplus. Board Member Breman Anderson, Jr. voted in June against a preliminary budget saying he hoped the board would be given information in the future to guide decisions. This time, the board voted six-to-zero to approve the 2011-12 fiscal budget. Board Vice-President George Flesher was absent for the vote. The tax levy increase comes at a time when the district has slim reserves, with a projected year-end reserve of just 4.591%. State auditors generally like to see a three-month reserve, but prefer a safety net of 24 percent, and put districts that drop below 4% on a watch list. To save money during current favorable market conditions, in July, the Hickman board approved a “Go To Market” resolution to refinance the district’s Series 2003 General Obligation Bond, valued at $15,975,000, at lower interest rates. September 27, the Board of Education approved a resolution that split the bond into two pieces to refund $9.65 million of the bond now, saving the district $1.4 million. Flesher was absent during the vote. “My plan would be to follow up in early 2012 with the refunding of the balance of this 2003 issue, and our preliminary indications would be, if the market doesn’t change radically, we could save another half million dollars on that issue,” said Nutterfield. On the refinanced issue, the school board’s rating was downgraded from A+ to A with a negative outlook. “Since the financial meltdown that we had in ’07, investors are interested in having a rating on the school district itself, separate and apart from the state program,” Nutterfield explained. Hickman had an A rating through the early 2000’s that was upgraded to A+ in 2003. The “negative outlook” classification could be removed in the next nine to twelve months if the district successfully adopts a balanced budget or a slight surplus for Fiscal Year (FY) 2013. In another effort to save money, the Hickman board joined other school districts by agreeing to work with Energy Education, a firm that works with organizations to change behaviors that conserve energy and reduce utility bills. The adoption is expected to save the district some $440,000 annually in energy costs. Nutterfield said the idea of the program is revenue neutral. The Grandview C-4 School District will not raise their operating or debt levy this year. The school board unanimously voted on September 22 to maintain their total tax levy at $5.8936 per $100 assessed valuation, opting not to raise the $.80 levy for the debt services fund. The $5.0936 levy for the operating funds was already at the maximum allowed by the state of Missouri without voter approval. The assessed valuation for 2011 slipped some 2% from 2010 levels, falling from $432,544,063 to $424,351,578 in 2011. Those figures represent an $8,192,485 reduction from last year. Despite the reductions, however, the C-4 school board felt that they would be able to meet their debt service needs in 2011 without raising the debt levy. Assistant Superintendant of Operations and Finance Ann Marie Cook explained that a raised levy could be too burdensome for taxpayers in an already difficult economy.